The Naked Apartments team crunched some numbers from our rental database and came up with some interesting facts about the average rent in NYC. Here’s a breakdown. The average rent in NYC varies widely depending on what borough you live and how big your apartment is. 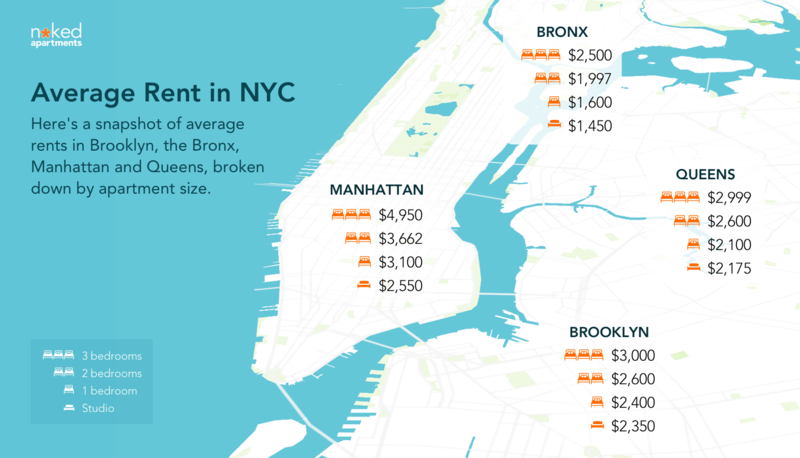 In the outer boroughs, the price difference between multi-bedroom apartments, 1-bedrooms and studios tends to be much smaller than in Manhattan, where major price leaps occur between apartments of different sizes. Here’s a breakdown of the average rent by apartment size in Manhattan. Here’s a breakdown of the average rent by apartment size in Brooklyn. In Brooklyn, you can expect an additional bedroom to add between $100 and $300 to the average rent. Interestingly, the average rent for a studio is higher than it is for a 1-bedroom. This could be due to the higher density of studios in new luxury buildings, and the wide range of buildings with 1-bedroom apartments. Also worth noting is that the average 2-bedroom is just $240 more than a 1-bedroom, suggesting that for renters on a budget, a 2-bedroom split between two roommates might be the way to go. In Queens, we see a similar pattern to Brooklyn, where studios are actually more expensive than 1-bedrooms. Again, this is likely due to there being a higher density of studios in new luxury rental buildings, while 1-bedrooms can be found in both new and old housing stock. If you are in the market for a multi-bedroom apartment, the average rent for 3-bedroom in Queens clocks in at just under $3,000, making it a relative bargain for NYC. Here’s a breakdown of the average rent by apartment size in the Bronx. Like Manhattan, increases in average rent in the Bronx correspond with increases in apartment size. In the Bronx, however, the increases are much more even, with the typical cost difference in apartment size being $400 or $500. The only exception is the difference in average rent for a studio and a 1-bedroom: just $150, suggesting you get more bang for your buck with a 1-bedroom than with a studio (and perhaps even a 2-bedroom). How Much Income Do I Need to Rent in NYC?